When people stockpile items and equipment for SHTF, they usually focus on food, water, ammunition, medical supplies, and so forth. That’s fine, but since all their attention is on the main things, they tend to overlook the little things… things that will be very useful. For example, alcohol. The ethanol in alcohol can serve as a natural disinfectant in the event of an emergency because it kills off the bacteria around the wounds. However, it can also destroy cell tissue in the same areas, so apply with discretion. For this, you’ll want to use grain alcohol. This one applies mostly to medical equipment like scalpels and thermometers. But don’t just spray or wipe them down; completely submerge them in alcohol. You could also use it to disinfect your hands if you don’t have gloves. If you need a clean surface to work with (for medical equipment, handling food, etc. ), just spray a surface with alcohol and wipe it down to disinfect it. Use enough to make the surface pretty wet, and let it air dry before using it. Vodka is definitely the best option for this since it contains no odor and is clear. It can be sprayed in small rooms or on clothing to kill bacteria and get rid of foul odors. Bacteria grows best where there’s moisture, such as under your arms or between your toes. But alcohol displaces moisture, so a bit of alcohol in those places can stop bacteria from growing and thus stop those areas from smelling as bad. Some tinder or a piece of cloth soaked in a solution that contains alcohol (such as hand sanitizer) will serve as an excellent fire starter even when the weather is cold and wet. This is kind of a weird one but I think it’s worth mentioning. Pour alcohol in a glass, crack open an egg and drop the insides into the alcohol, then wait at least an hour for the egg to cook. Eventually, the egg white will be solid and the yoke will be firm. Your firearms will need to be properly cared for in a long term SHTF situation, but when traditional gun cleaning oils become scarce, alcohol can be your go-to alternative. Swooshing around some vodka in your mouth will provide immediate and short-term relief for any pain you have from your teeth or gums. Oral hygiene will be very important after the SHTF, especially since very few dentists will be available. Swoosh alcohol in your mouth for at least 30 seconds to kill the bacteria around your gums and teeth. This one applies mostly to hand sanitizer, but other solutions and products that contain alcohol in them also work. If you ever need to remove some glue, such as the glue that remains after removing sticky labels, applying a small amount of alcohol will make it easier to come off. A small lamp can provide heat and a place to cook without having to manage a bigger fire. But a small makeshift lamp or candle will require fuel just like any other fire, and adding small amounts of alcohol at a time is a great way to keep that lamp going. For this, you can’t just use regular liquor. You could try some 100-proof vodka, but you’re better off using ethanol or denatured alcohol. This is really only for people who love messing with their camp stoves. You can learn more about that here. A skin rash from poison ivy is no fun, plain and simple. And it’s more serious when you don’t have access to traditional medical supplies. Applying alcohol to the rash won’t make it go away, but it does relieve much of the pain. The same goes for bug bites. Mosquitoes will be everywhere once mosquito control services stop. And other types of bugs will breed fast due to unsanitary conditions that come about when garbage trucks stop rolling. Apply some alcohol to the bug bite for quick relief. Better yet, stop bugs from biting you in the first place. Alcohol mixed with olive oil can be rubbed on the skin to serve as a natural repellent to mosquitoes and other insects. This one obviously won’t matter to some people, but if you’re concerned with the way your property looks during a disaster, alcohol will kill any unwanted weeds. Mold needs moisture to live, but alcohol displaces water and causes it to quickly evaporate. When the mold dries up, it will die. This might not sound very important, but mold can be very bad for your health. In some cases, it can be deadly. A simple cough may start out innocently enough, but if it progresses far enough, it will become not only annoying but also bad to your health. A hot toddy makes a great cough syrup. The steam from a warm alcoholic drink such as a hot toddy can also dilate the blood vessels in your nose and clear out the mucus. Plus, it will soothe a sore throat and help you get to sleep. This is arguably the most important use on this list. Alcohol will be in high demand after the SHTF, so having a large stockpile will give you an advantage in a potential trade. You might be surprised what some people will be willing to give you in exchange for a few bottles of beer, wine, or liquor. You can remove frost from a car’s windshield in the winter simply by spraying or wiping alcohol on it and then wiping it away. Warm water and alcohol mixed equally together makes for an effective fungus eliminator, especially on the feet and in the ears. Have any stains that need to be removed from practically anything? Spray them with alcohol and scrub away. This will remove most if not all of it. If you want to keep your jewelry or precious metals clean, soak them in rubbing alcohol and wipe them dry with a clean cloth. Some people will have a hard time relaxing after the SHTF. Even if they’re safe and well-fed, just thinking about what’s happening out there can make people very stressed out. Sipping some scotch or whiskey with a little bit of water can help them relax. Last but not least, drinking a little bit of alcohol for recreational purposes in a disaster scenario can provide some badly needed morale for when the going gets tough. Just don’t overdo it. It’s one thing to wake up with a mild headache, but you don’t want to wake up completely hungover during a disaster. 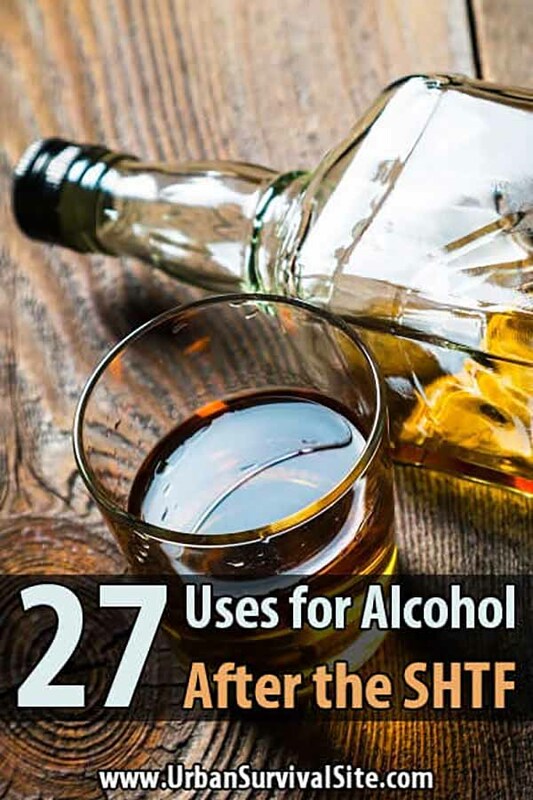 You probably won’t need alcohol for all the suggestions on this list, but you’ll be surprised how many of them you do need it for. Alcohol, in its various forms, is an important commodity to stock up on. If the SHTF in your area, you’ll be glad you have it. First rubbing alcohol can do all but one of these thing better than a drinking alcohol. That one is #27, okay #21 would move faster as a drinking alcohol. All the preppers I know put drinking alcohol right behind, gold,silver, edged weapons,bush tools,fire starter & food for Bartering. So at least half of your stored alcohol should be medical alcohol. Plus you should have a safe way to produce more alcohol.